Welcome to “Askar&Tamara” guesthouse’s website! “Askar&Tamara” is the private, tourism oriented guesthouse situated in Tamga village which is located on the picturesque southern shore of big Issyk-Kul lake (Issyk-Kul is a second largest mountain lake in the world) of the Kyrgyz Republic. Our guesthouse is located next to Issyk-Kul military sanatorium (“KSAVO”). This sanatorium once was famous recreation center for the whole USSR’s military generals of armies and chief officers but the most VIP persons who visited this sanatorium were Uriy Gagarin (first spaceman in the world), V. Tereshkova, A. Leonov, G. Titov and other famous spacemen of the USSR. “Askar&Tamara” guesthouse provides services for so-called eco-tourists who arrive mostly from USA, England, Germany, France, Holland, Finland, Austria, Switzerland, Israel, Japan, Australia, Belgium, Spain, Italy and other countries. 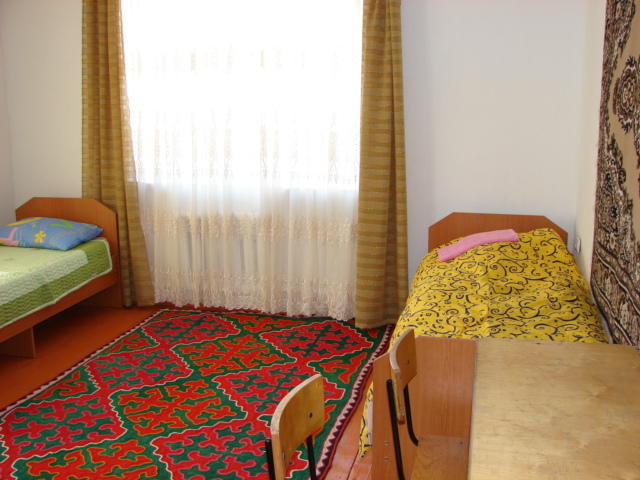 Our cozy three-storey guesthouse consists of 12 double and 3 triple rooms designed in kyrgyz traditional way with beautiful view to mountains, also there are dining area and well equipped kitchen to serve dining area for breakfasts and dinners. Smallness of our hotel is compensated by very big garden which occupies about 4500 square meters, all our tourists find it huge and beautiful and enjoy walking around and taking picture there. In our territory we also have grocery shop which makes it comfortable for our tourists to make private purchases. Besides, on our tourist’s request, we organize local sightseeing, trekking, hiking and horseback riding trips involving local young people for these services. In cooperation with city tour operators and other regional guesthouses “Askar&Tamara” guesthouse is also engaged in attracting eco-tourists to the Issyk-Kul region. The main goal of our hotel is to attract tourists from abroad thus contributing to development of our region and to provide more employment for local people. We try to do our best to provide as much as possible good and sincere service to our tourists. Speaking of good service we are proud to say that our guesthouse “Askar&Tamara” once was very positively marked in the guidebook “KYRGYZSTAN” (author Laurence Mitchell, published in London) and in one of the editions of guidebook series “Lonely Planet”. We can organize different individual tours and trekking for you, these can be discussed upon your arrival. You are welcome to our guesthouse!